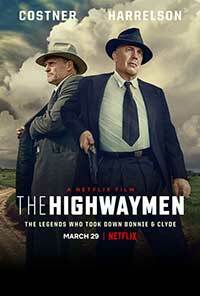 The legend of bank robbers Bonnie Parker (Emily Brobst) and Clyde Barrow (Edward Bossert) never seems to grow old, as Netflix brings this story and its two lead characters Frank Hamer (Kevin Costner) and Benjamin Maney Gault (Woody Harrelson) out of mothballs with The Highwaymen. It is early Depression-era Texas and Governor Miriam “Ma” Ferguson (Kathy Bates) is taking heat for Clyde’s recent escape from prison. Ma must stem the tide of public opinion that considers this criminal couple as folk heroes who attract large crowds wherever they travel with seeming impunity. As a last-ditch effort, she has Marshall Lee Simmons (John Carrol Lynch) recruit retired Texas Rangers Hamer and Gault to track down these two outlaws and end their crime spree. Simmons approaches Frank with a lucrative offer to put on his badge one more time but since he is comfortably retired, his wife Gladys (Kim Dickens) opposes her husband’s return to the hazards of law enforcement. Frank takes off anyway and coaxes Maney to join him. Unlike Frank, Maney is dirt poor, has a bad limp and questionable eyesight so the thought of extra cash is quite appealing. Governor Ferguson wants to avoid the embarrassment of having these two old codgers steal her thunder, so she conveys a direct message to Detective John Quinn (David Furr) to bring in his own forces and beat them to the punch. However, they have greatly underestimated the resourcefulness of these two men who pile an impressive arsenal into Hamer’s new car before they start tracking the fugitive couple . Although the two men acquire numerous leads, they always seem to be one step behind as the body count of dead policemen continues to rise. They nearly nab the pair in Coffeyville, Kansas but a swarm of adoring fans impede their progress and their quarry easily escapes. Hamer and Gault arrive at the Barrow family home in Bienville Parish, Louisiana and meet papa Henry (William Sadler) who wants them to just “end it.” Deputies Ted Hinton (Thomas Mann), Prentiss Oakely (Brian F. Durkin) and Bob Alcom (Dean Denton), Agent Kendale (Jason Davis) and Sheriff Henderson Jordan (David Born) join the team for a one-sided shoot-out that dispatches Bonnie and Clyde in less than two minutes. As an end-credits footnote shows actual photos of Barrow’s bullet-riddled car, it is ironically noted that the funerals of Bonnie and Clyde drew thousands of mourners, far more than did those of the lawmen that they murdered. 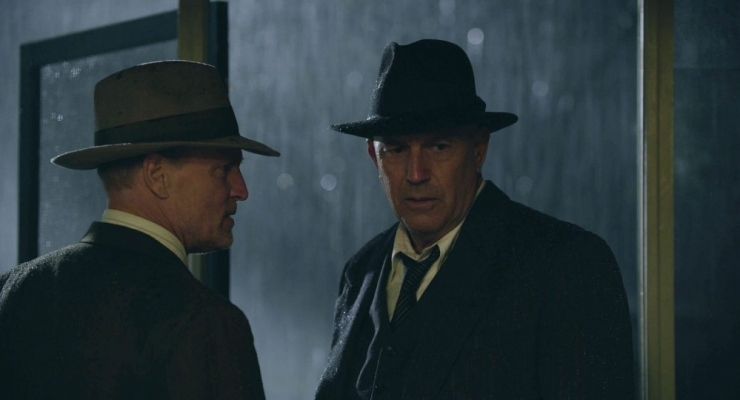 Woody Harrelson and Kevin Costner in The Highwaymen (2019). In 2005, producer Casey Silver originally pitched this film project to Paul Newman and Robert Redford, but it lingered on the vine for more than a decade until Netflix picked it up. Shot on location at various sites around Louisiana, John Schwartzman’s camera crew delivers a stunning recreation of the Depression-era South where tent cities and crushing poverty were ubiquitous. Period costumes and vehicles add a further sense of realism to a story well-crafted by Joe Fusco and unerringly directed by native Texan John Lee Hancock. While I would have loved to have seen the Newman-Redford team, Woody Harrelson and Kevin Costner do a splendid job in realizing these laconic, paunchy former lawmen who simply get their job done. In sharp contrast to the gory fifty year-old version of Bonnie and Clyde starring Warren Beatty and Faye Dunaway, The Highwaymen focuses on the pursuers rather than on the pursued. It minimizes the romanticized aspects of two psychopaths who might have been larger than life in the media but, as Hamer and Gault find out during an examination of the couple’s wardrobes in one of their hideouts, smaller than life in person. Netflix did well to pick up this property and finally allow us to see a terrific story told by a top-notch cast and crew. Highly recommended. Netflix revives the legend of Bonnie and Clyde from the perspective of the two former Texas Rangers that took to the highway and eventually tracked them down. Outstanding performances by leads Woody Harrelson and Kevin Kostner are complemented by a strong supporting cast and direction.